In Tripura, union home minister Rajnath Singh promises to light up each household without electricity within six months. There is nothing wrong in it. But the irony is people of a power surplus state like Tripura expect something else except power when it comes to vote for power. Rajnath Singh’s promise may sound surprising but true. At least if one goes by BJP’s campaign for the poll bound state through its twitter handle. 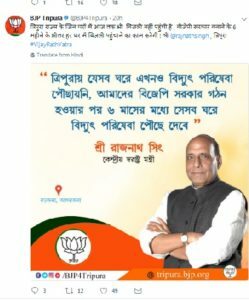 Tripura BJP in its official Twitter handle bjp4tripura uploaded a post with photograph of union home minister Rajnath Singh promising to give electricity in each unelectrified household if voted to power. The poll campaign in the twitter handle of the BJP in Tripura raised eyebrows on the promises of the union home minister. Apparently the uploaded post was about the speech of Rajnath Singh at a rally in Barjola on Saturday. Singh addressed an election rally at Barjala in support of party candidate Dilip Das. 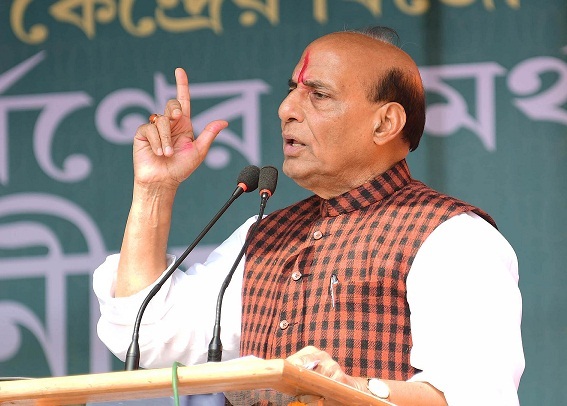 The union home minister is on a two-day tour to the poll bound state. The state is having myriads of problems except power. There are other issues in the state like unemployment problems. Even Tripura Governor Tathagata Roy last year said the biggest problem in the state is unemployment besides road communications. Last year as per government data regarding the number of electrified and un-electrified villages across 19 states of country, including the seven states of the Northeast, showed that Tripura which earlier had 26 un-electrified villages, was the only the state in the Northeast to have lit up all its villages. Since March 2016, Tripura has been supplying 160 MW of power to Bangladesh and is ready to provide an additional 40 MW if the central government permits it to do so. Interestingly, Rajnath Singh’s home state Uttar Pradesh is currently facing an acute power shortage. In spite of Energy Supply Managment, UP has a peak demand deficit of about of 15% while its energy shortage is about 8 percent. Tripura, once ravaged by insurgency for more than three decades, made considerable progress in other sectors and emerged as the power surplus state in the northeastern region in 2014.